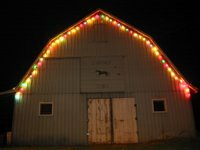 Big Blue Barn: Weekend? What weekend? The Friday night concert went pretty well, it was quite a long show, with all sorts of performers. It put us into the Christmas spirit, since many of the songs were seasonal. I think we managed to sound pretty good (although my voice was at times squeaky, not being properly warmed up). We messed up in a few spots, but I don't think the audience noticed. We have three more performances before the break, so we'll get a chance to iron out those little issues. On Saturday night, the show we went to was by a Belgian group called "C. de la B. ", which is ostensibly a ballet troupe, but the performance was very modern, and so much more than just ballet. I was reading the biographies of the artists after the fact, and many of them have a circus background, which showed. There were many moments where we were shocked to see what these people were able to do with their bodies. I was mostly impressed with how accessible the whole show was - I am not usually one that "gets" dance shows all that well, but I actually felt all sorts of emotions that (I hope) the choreographer was trying to invoke. It was a very stirring, and at times even disturbing performance. Hoping all our friends on the West Coast are somehow digging themselves out of the piles of snow! I can't believe the weather reports I'm seeing from out there!